General items that fit either no category or more than one category. Bell announced their iPad plans today and not unsurprising they are an exact match for the plans that Rogers announced earlier. For $15 you get 250mb which is a nice lite starter plan, and then beyond that they offer 5gb for $35. In Canada, we have all the major players offering up plans for the iPad and yet we are lacking an unlimited plan as seen in the USA by AT&T. Down there they have the usual $15 for 250mb but they also offer unlimited for $29.99 which is very nice. Let’s hope that when Telus finally gives word on their plans they mix it up a little and offer something different. I don’t want three different carriers offering the exact same thing. Why not bring on a reasonable pay per use rate (not $x / MB, I mean x cents / MB)? I personally would be fine with 2 cents per MB this would give me a good enough rate for light browsing and let me get around paying $15 for something I may not even use in a month. If I used 1gb, well then I would be paying $20, sounds reasonable. If I want more then I would pay for a monthly plan. Another idea might be allowing for data sharing between a regular smartphone and the iPad. I know that my data usage would definitely go down on my cellphone with an iPad. Some users may even be inclined to reduce their cellphone data plans to compensate for this. If they offered the ability to share the data between a cellphone and iPad some users would probably even increase the amount of data on their current plans to share. I’m not into financials enough to know whether this type of data sharing would help ARPU as its a single user paying more or whether the two devices would split the revenue over “two” users. Either way, increasing the revenues and offering something the competition isn’t would go a long way in this very tight iPad battle royale. I haven’t been much of a book reader my whole life but the thought of having a library worth of books on me at one time seems intriguing. The technology in e-book readers have been coming along and its just a matter of time before I jump in and grab one. On one hand there is the Kindle with its tie in to Amazon which is a fantastic idea and then on the other is something like the Sony PRS-300 which allows for more openness in its formats. I know I would be the type to choose the open platform and not always has it been a Sony device that falls into this category. The battery life on the Sony is about 6800 page flips and it stores 440mb worth of data. The decision I will have to end up making is whether a device like an ebook reader is a device that is doing just one task when another device on the horizon, the Apple iPad seems to be the type that can perform a wide range of tasks. What will end up being a deciding factor for me will be availability of unlimited 3G in Canada. If Apple pulls through and does that for all of us Canadians, I would be more inclined to grab an Apple iPad for my e-book needs. In a surprising turn of events, Industry Canada reversed an earlier decision by the CRTC to allow Globalive’s Wind Mobile to operate in Canada. The original decision on October 29th by the CRTC found that they did not have sufficient Canadian control of the company. The reversed decision found the opposite to be true which seems surprising that a company with so much foreign investment be allowed. There was even a quote from Michael Hennessy of Telus twitter account saying “if Wind is Canadian then so is King Tut” which is a jab at the ownership of Globalive and the disappointment following the decision. So far though no plans or pricing has been officially announced. Most likely details will be made available by next week or over the weekend. After having Borderlands for the past week I am happy to give it my own little review. The game has really pulled me in and captured me. This is a first of its kind for me; a FPS RPG. I continue to get the urge and play the game to search for loot and complete quests. I even started a second character to try the game from a different perspective. My initial character is a soldier and I just finished all the quests in the Arid Wastelands. There just feels like so much to do in the game and it doesn’t feel old or boring at all. The amount of variety in guns, shields, items and the whole online coop experience really puts this game above the rest. For a game I just decided to buy on the spur of the moment last week I feel I made a great choice. It really makes me feel like I am back in the Diablo 2 days where I would play for hours and hours online dungeon crawling and questing. If you still haven’t heard of the game yet I urge you to look it up and check it out. Come find me online and it will be a lot of fun. I would give it a perfect score for sure. If you still can’t find the game (I know there are more than a few of you), keep looking and don’t give up this game is worth it. I have been checking for the past week and it has been crazy. In Regina, Saskatchewan, there were no copies at Best Buy, Future Shop, Wal-mart, Zellers, EB Games, HMV, Toys-R-Us, Blockbuster, and Rogers Video. Talk about short shipping a game (or incredibly amazing sales). There was even a response from Gearbox (developer) in regards to the shortages. I hope they can get their supply chain issues sorted out because this is a real winner they have on their hands. On the spur of the moment given the opportunity to save I picked up Borderlands for the Xbox 360. As had already been seen once before with the launch of Batman : Arkham Asylum, Borderlands was introduced at a very cool $39.99 (Canadian Dollars!). Wal-mart Canada appears to have started off this (limited time/limited quantity) pricing strategy but have been matched by Future Shop and Best Buy. This kind of launch will not only spur a whole lot of sales but may also bring about a new way to release games. The traditional model of the past has always been to release the game for a lot, and then after a long while slowly bring the cost down possibly in the form of a greatest hits packaging. With the huge commercial success of Batman, which is sure to be followed by Borderlands, a new model has been created. Reports are coming in across Canada about the game selling out and stock moving very fast across store shelves. Lets not forget about the real winner of the day, Borderlands! The game is actually very well done and seems fresh. The game can be quickly described as a Action FPS RPG. The game takes the shape of the traditional FPS but puts together a string of tasks and weapons that follow the structure of an RPG. The game is said to contain 100’s of thousands of unique weapons. The game can be played solo but from most opinions it is best played with 4 friends in online coop. Early reviews are giving the game an 8 – 9 out of 10 which is fair. I won’t make any critical remarks about the game until I can put a little bit more time into it but from what I’ve seen so far I have enjoyed. If you can still manage to find the game for sale before October 27 at the sale price I would say to go for it. Even afterward I am sure the game would be worth the full price at $69.99. Google Street View became available to a select number of Canadian markets today. When you visit the Google Maps site, you can drag the little man standing on top of the zoom status anywhere on the street. The major centres which now have the Street View enabled include: Vancouver+area, Calgary, Ottawa, Kitchener, Hamilton, Toronto+area, Montreal, and Halifax. I know it wasn’t too long ago when I saw them driving around in Saskatchewan so I imagine more areas will becoming online soon. It seemed like not too long ago when doubts were being raised whether it would ever come online due to the privacy laws here in Canada. 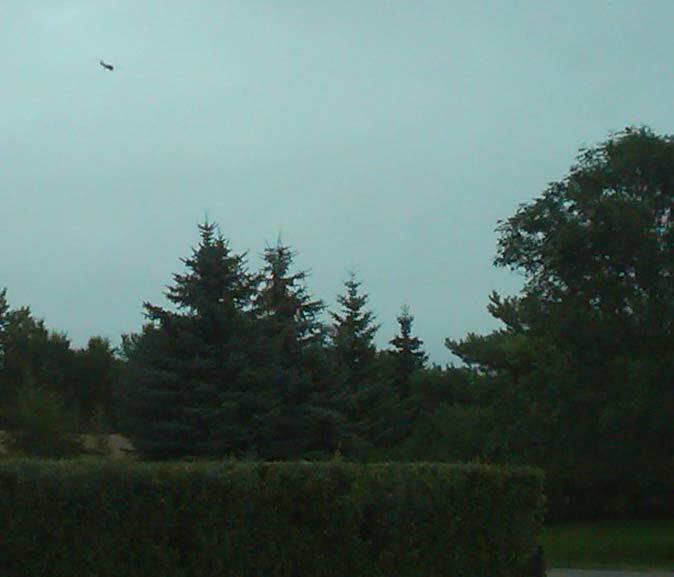 Just driving home from Regina today and noticed a smaller plane flying very low over Emerald Park / White City. The plane kept circling over the entire area. I imagine it is being used to take pictures. My guess is an expansion for the “birds eye view” at Microsoft’s Bing Maps. Better keep my eyes open to see myself driving around once the new maps do come out. I just received my Motorola Rival A455. I won it in a random draw at work for completing a Motorola etraining course. It is a very sweet prize indeed. I ended up getting the purple Rival, a weird t-shirt and some strange card game. The prize is alright but I was looking forward to the silver model. The phone itself is kind of cool for text messaging with its side sliding full keyboard. Telus is selling it right now $399 no contract, $349 on 1 yr, $299 on 2 yr, and $99 on 3 year. I wonder what mine would be worth on the open market? I have to thank Motorola again for such an awesome contest and the great prize. I doubt I will be using it as my primary phone is still holding strong but I am sure it will find itself being used sometime.